Rebecca posted this incredible photo of an inukshuk on her Rebecca Writes blog. Her son took the shot while hunting up in the Yukon. An inukshuk is a landmark. "Inukshuk (singular), meaning "likeness of a person" in Inuktitut (the Inuit language) is a stone figure made by the Inuit. The plural is inuksuit. 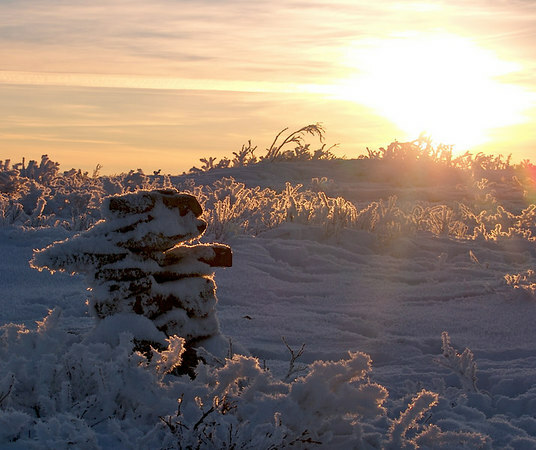 The Inuit make inuksuit in different forms and for different purposes: to show directions to travellers, to warn of impending danger, to mark a place of respect, or to act as helpers in the hunting of caribou. Similar stone figures were made all over the world in ancient times, but the Arctic is one of the few places where they still stand. An inukshuk can be small or large, a single rock, several rocks balanced on each other, round boulders or flat. Inuit tradition forbids the destruction of inuksuit. " What landmarks do you have in your life to indicate times when God met you in a significant way? What about me? Landmark occasions have been the morning I met Jesus Christ, birthdays, anniversaries, etc. Times when God proved His faithfulness. I trust that each of us have plenty of "inuksuit" along the pilgrim pathway to declare God's faithfulness. He has certainly led us each step of the way. starting a blog was a landmark spot for me, it really did help me to connect with like minded souls ... and to be encouraged along this walk that sometimes felt so solitary ... like the picture of the inukshuk ... yet regardless of how solitary it may have seemed - the SON was still shining His light on my life ... i may not have seen it - but we don't always see the obvious do we! A very significant one for me was when our son had a significant head injury his senior year in high school. He was knocked out before he ever hit the ground and when he did hit, the back of his head hit the asphalt. He went into a grand mal seizure which lasted 6 minutes. There is a whole bunch of "stuff" which led up to this which I won't go into. Suffice it to say both Pilot and the other young man were solid Christian men and leaders at their Christian school. The head injury changed our son, significantly. His personality changed. It happened on August 24 and he did not speak unless spoken to and then only replied with the barest answer, "yes" or "no." There were no smiles, no easy going personality. Just anger, immense anger. Oh how I prayed, and prayed, and prayed. Finally, in Dec, on the 10th, I prayed asking the Lord to help me love my son unconditionally, because I did not like the personality that emerged from the head injury. I knew I would not be able to do it without the Lord enabling me. Slowly, during his Christmas break, he began talking again, here and there. January came around and the graduation information began to circulate. He had already informed us that he was NOT going to go through with the graduation ceremony. At the end of January he came to me with the info and said that he had changed his mind. He would go through with the ceremony. Early February he told me was going to try and graduate with honors. (An effort which I didn't think would be possible after his first semester.) I encouraged him to go for it. April, he came to me and asked for a school ring. You see, after the injury, he wanted to graduate from public school...any school, other than his Christian school which he had attended since 4 year old pre-school. So when he told me he would like a ring...well my heart leapt for joy! I told him I would talk to his dad about it. Do you remember Joshua putting the stones by the river as a monument to remember? I told Jim that this class ring was my stone by the river showing God's faithfulness in restoring our son. May, he came to me and told me if he had it to do all over, he wouldn't change anything. Inwardly, I gulped. Why? Because I would not be where I am in my relationship with God otherwise. The things He has taught me and brought me through....I wouldn't give that up for anything, he said. It took a solid year, David, for him to regain his full personality. When we dropped him off at college I looked up to the heavens and praised the Lord for His healing powers. What a simply moving story. I think that David would fully agree!